Trends in Japanese company expatriation to Europe – or why are there so many Japanese women in Malta? 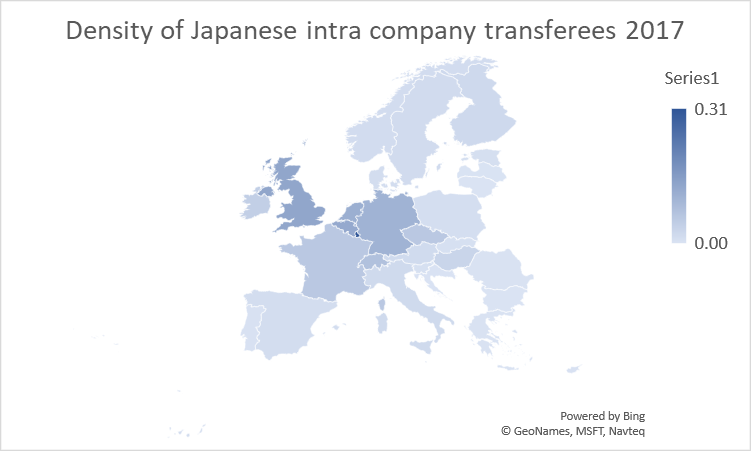 Despite a small decrease over the past three years, the UK continues to be the favourite destination in Europe for intra-company transferees – 8,684 as of October 2017 according to Japan’s Ministry of Foreign Affairs, compared to 8,518 in Germany. Japanese company sponsored expats in Germany and the UK make up about 58% of all Japanese corporate expats (around 30,000) in the EU/EEA. If you add in their dependents, it comes to over 50,000 Japanese living in Europe, at the behest of their employer. This compares to over 250,000 in Asia and just under 120,000 in North America, out of 463,000 Japanese intra company transferees and their families in globally. Of course the number of company transferees in a country is not purely a function of the market size. We crunched the numbers against population size and this interesting map showed up. The tiny dark spot is Luxembourg, where the population is only just over half a million and there are 175 Japanese intra company transferees resident. The UK has the next highest density, then Belgium, the Netherlands, Germany, Switzerland, France. The highest density in Eastern Europe is in the Czech Republic. The Ministry of Foreign Affairs sticks to the old fashioned breakdown of male/female employees and Luxembourg is also an outlier there, with 41% of transferred employees being female, only surpassed by Ireland (46% 95/205 transferees), Malta (90% 19/21) and Cyprus (50% 2/4 transferees). There are very low numbers of Japanese female employees in Eastern European countries, and also Belgium. Maybe this has something to do with Toyota’s regional headquarters being in Brussels. The average overall of female employees transferred to Europe is 25% of the total, and there has not been much movement in this over the past three years. The reason there are far more females proportionately in some countries than others has the same root cause as why there are more dense groups of Japanese in some countries than others – it depends on the industrial sector and the nature of the operation – whether it is manufacturing or services, or a regional headquarters. The UK has a high density of Japanese company expatriates partly because of the three large Japanese automotive production sites there, but also because of the high density of financial services and holding companies in London and the South East. Japanese banks, trading companies and insurance companies send a lot of Japanese expats to their regional HQs, which are usually in the UK, including trainees on short term secondment, many of whom are female. Technology companies such as Sony, Ricoh and Canon also have large regional HQs in the UK and a high number of expats. Similarly Ireland has a lot of financial services companies, particularly aircraft leasing. Luxembourg does have a couple of large manufacturers headquartered there – FANUC and TMD Friction – however, as you might expect, most of the other companies are financial services related. There also tend to be large numbers of expats every time production sites are set up – engineers on short term projects, involved in technology transfer. Double digit increases have occurred over the past three years in Japanese expats being sent to Poland, Sweden, Hungary and Slovakia following investments there. But the biggest increases numerically have been 602 more expats in Germany (up 8% over three years), 359 more in the Netherlands (up 23% over 3 years) and 252 more in France (up 7%) compared to drop of 62 (1%) in the UK. The Netherlands has been the choice of quite a few Japanese financial services companies, along with Luxembourg and Germany, for strengthening EU presence post Brexit, as well as a stronghold for logistics companies. Its tax regime has also been attractive for holding companies – more brass plate up till now, but it would seem, now with actual physical presence too. So why are there proportionately so many Japanese women employees transferred to Malta? Maybe they’re working at Konica Minolta‘s service operation there for 35 countries in the region*. A lot of smaller countries, with English and other language speaking graduate populations – such as Portugal – are becoming popular bases for outsourced support. This suggests to us that the UK may be slowly losing its grip on being the preferred base for regional, functional and services headquarters for Japanese companies, and therefore the preferred destination for Japanese expatriates. There is a long way to fall however. * Andre Spitieri (non resident Ambassador to Japan from Malta) contacted me after I posted this blog to say that there are a lot of Japanese women working in Malta in the tourism industry. According to the Ministry of Foreign Affairs, there is only one Japanese company in Malta, and JETRO says it’s Konica Minolta. It may well be that there are branches of the big Japanese travel agencies in Malta, to which Japanese female employees have been posted, who are counted among the 19 female intra company transferees there. Last updated by Pernille Rudlin at August 30, 2018 .